2k16 is upon us. That means 366 days of absolute agony getting the opportunity to go into the world and be the best that I can be. This year, apart from being my last year of high school, will be the year that I continue my progression from a heartless pessimist and cynic to a more open-minded optimist 🙂 The creepy smiley face confirms this, it’s friendly, innocent and almost completely innocuous. Almost. 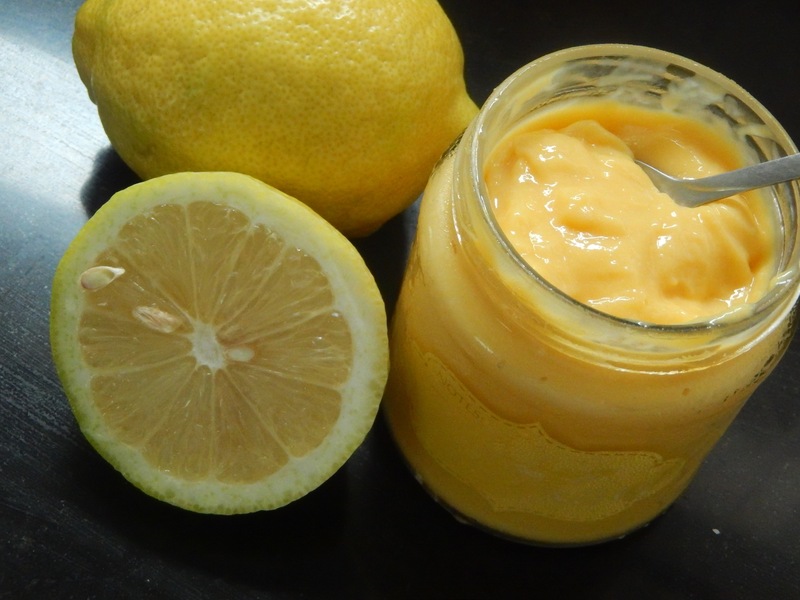 One thing I can definitely guarantee you is that you will be seeing a lot of this lemon curd in 2k16. A lot of it, you will be so sick of me like ‘Can’t you cook anything else? 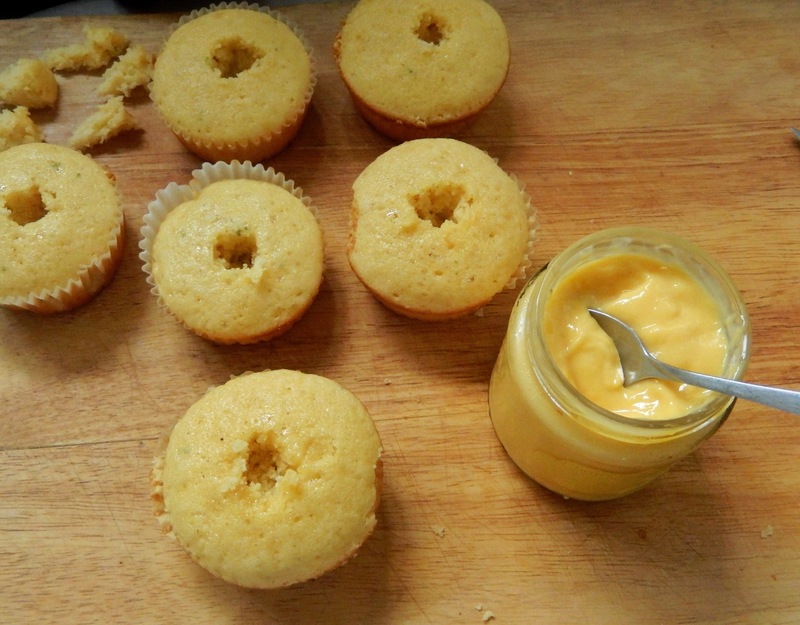 !’I can, yes, but I just feel like I’m not yet done with this creamy yellow deliciousness, I have very big plans for it. Very big plans indeed. 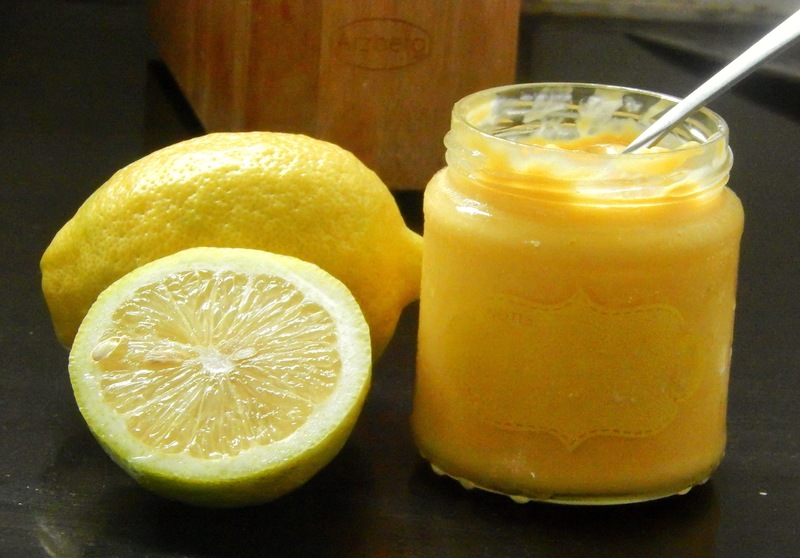 My first attempt at making lemon curd was about a year ago, and only about 56% failure. At the end of the day, I had a very yellow, very sour, very yummy substance. Just that it was liquid. It had not thickened AT ALL. Reason being that I was very impatient with my curd on the stove and had removed it prematurely. And this is where I warn you, do not, and I repeat DO NOT remove the curd from the stove top until it has thickened considerably and when you run a spoon through it, it leaves streaks. Also, you’re probably going to wonder if using 6 egg yolks is really necessary. After my first fail at this recipe, I decided to return to my office/bedroom to fully understand what went wrong and how I could fix it. Purely by analysis of ingredients, I deduced that the only way to get a thick lemon curd, would be to add more egg yolks. And so I did, and I am happy with the results. Or if you’re concerned about the 6 egg whites that will have nowhere to go, here’s an idea: whisk the egg whites together briefly with a pinch of salt and pepper and fry them like an omelette. Easy peasy protein packed breakfast. Don’t like sweet stuff? Add less sugar. Want it to be more tart? Don’t be shy with that lemon juice! The colour making you sick? Use more whole eggs and less yolk, that’s the easiest way to tone down the beautiful sunshine colour (you heartless monster). Another note: do not try to cook this in a saucepan. Because you will fail. And you will have a plate of lemony scrambled eggs on your hands. You have been warned. Instead, fill the saucepan about ¾ of the way to top with boiling water, put your stove on the lowest heat setting, sit a large bowl over the saucepan and make your curd in there. Just make sure the bowl is not plastic. I also happened to make the mistake of melting the bowl and having it glued to the pan. And I’m supposed to be the scientist. If you feel like you are going to die before the curd is ready, feel free to turn the heat up a bit on the stove, just remember what I said about scrambled eggs then remember that patience is a virtue and this curd is to die for. But Andrea, what on earth will I do with a jar of this heavenly pud? I’ll give you a few ideas, spread it on your toast, fill some pastry with it, use it as a filling for cupcakes (coming soon, spoiler alert), ice your pavlova with it (also coming soon) or just grab a spoon and indulge! 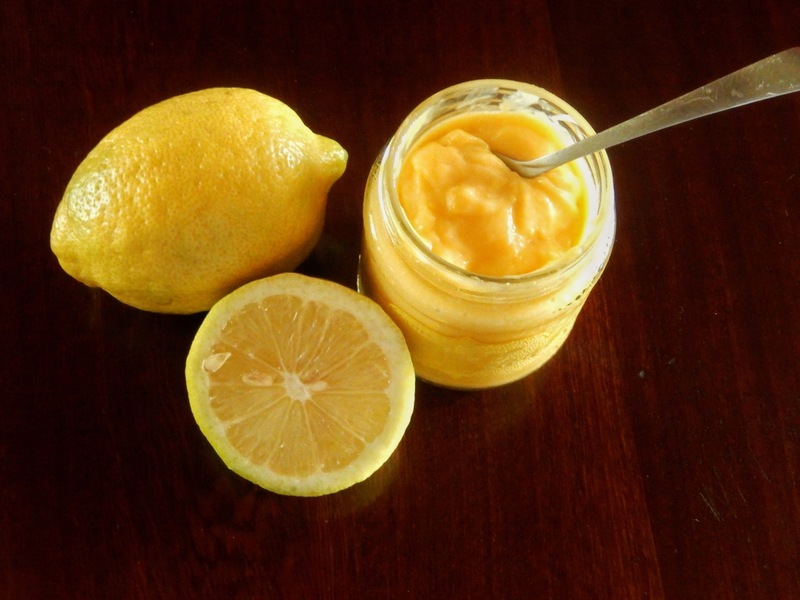 If it’s acceptable to eat Nutella out the jar, the same should go for lemon curd. Fill a saucepan ¾ of the way to the top with boiling water and set it over the stove on low heat. Place your bowl over the lid of the saucepan and stir continuously, taking breaks, until the mixture has thickened considerably and when you run a spoon through it, it leaves permanent streaks in the curd. This will take you between 10 and 15 minutes. 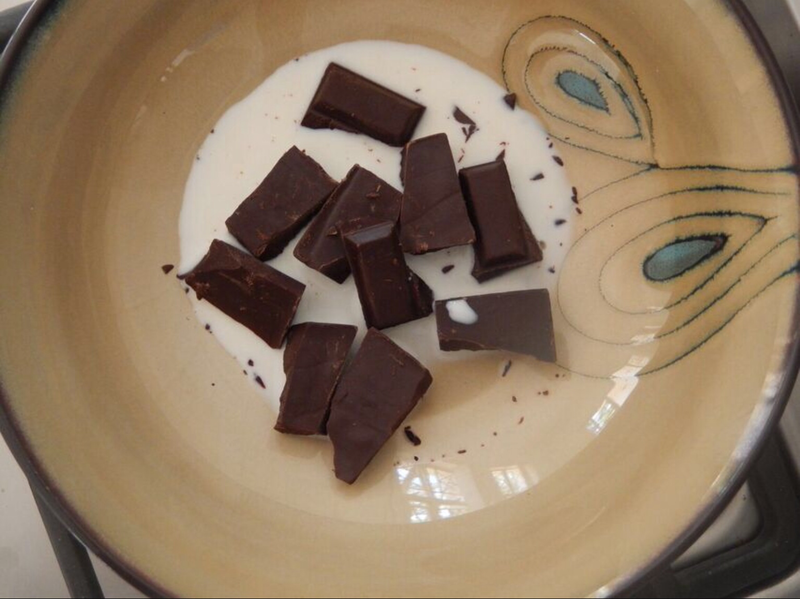 If after 15 minutes, the curd hasn’t thickened, increase the heat and continue to stir until it does. Remove the bowl from heat and add the margarine pieces bit by bit until all the pieces have melted and combined to give you what we can now call, LEMON CURD. 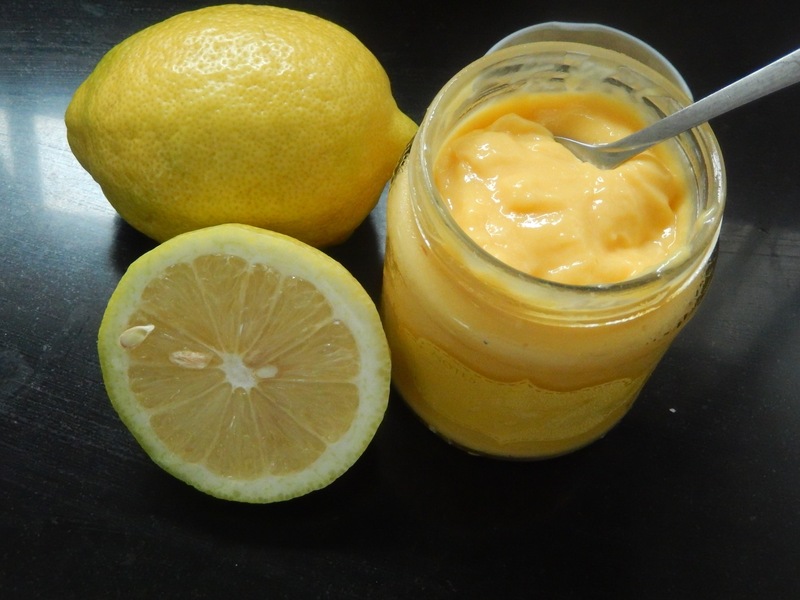 Strain the curd into a jar to remove any lumps/cooked egg. Refrigerate for at least an hour and serve. *If you’re a bit nervous about adding 6 egg yolks, it’s okay to play with the ingredients and add 4 egg yolks and 3 whole eggs, or 5 whole eggs and 2 egg yolks, your curd will just be less thick and the colour won’t be as strikingly yellow. I know, I know, I know, I was supposed to update a couple of days ago, but sometimes life gets in the way and you get distracted by other things. Like this lemon curd that I’ve since used to make these crepes, these bars and these mini cheesecakes! 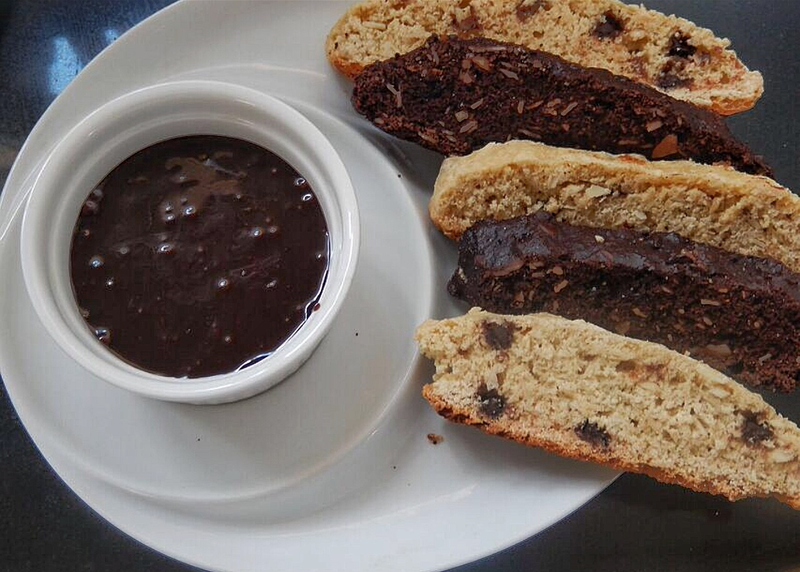 And these cookies that are the definition of heaven-sent. Onto today’s meal. Soup. 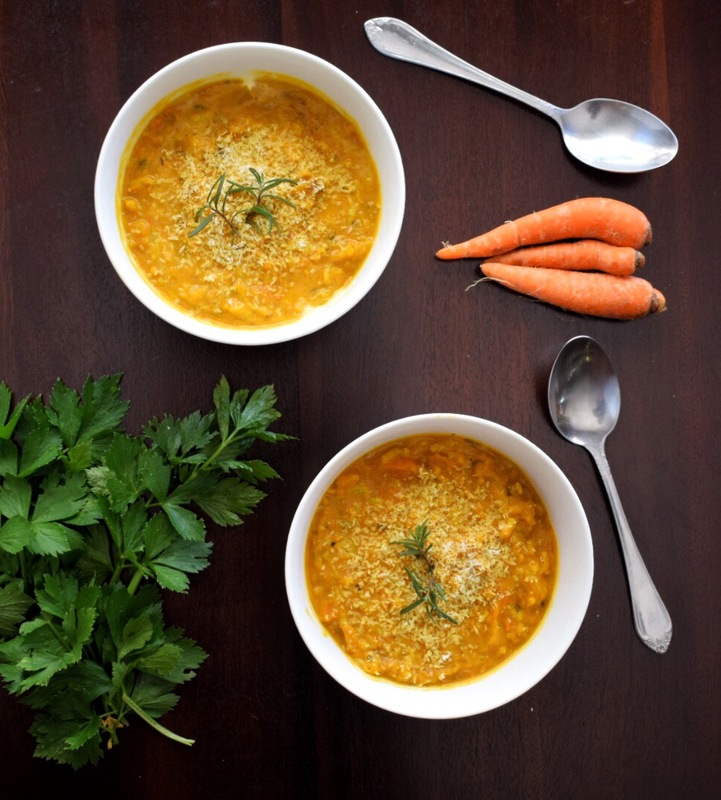 And no- soup is not for the senile and toothless, soup can be a delicious appetizer that can be enjoyed by people of any age regardless of what their dental situation is. And this soup is not for the faint-hearted, it bites back. Hard. No worries if you’re not a fan of chilli and spice, I won’t judge you (out loud) you can just choose to reduce the amount of curry powder you add, omit it all together, or increase the amount of coconut milk you add when serving. f you’re not a fan of butternut, you can swap it out for another vegetable like pumpkin or cauliflower with this recipe, you will just have to adjust the cooking times as necessary. My favourite part of this dish is actually serving it, spooning the hot soup into bowls and getting to make really pretty and unique patterns at the top with the coconut milk. That’s probably what I love the most, no two dishes will ever look the same. If you want to be fancy-schmancy, you can choose to garnish your soup with toasted coconut flakes and a mint leaf. All you have to do is heat a non-stick skillet on high heat, and add desiccated coconut/coconut flakes to the pan and cook for about a minute or until the coconut is lightly browned. Simple! This soup works really well as a starter, served with homemade bread, or as a light lunch when you feel like being posh and minimalistic. Add the minced garlic, ginger and lemongrass and cook until fragrant, about a minute. Then add the curry paste, stirring to coat the spices in the mixture and cook for 2 minutes. 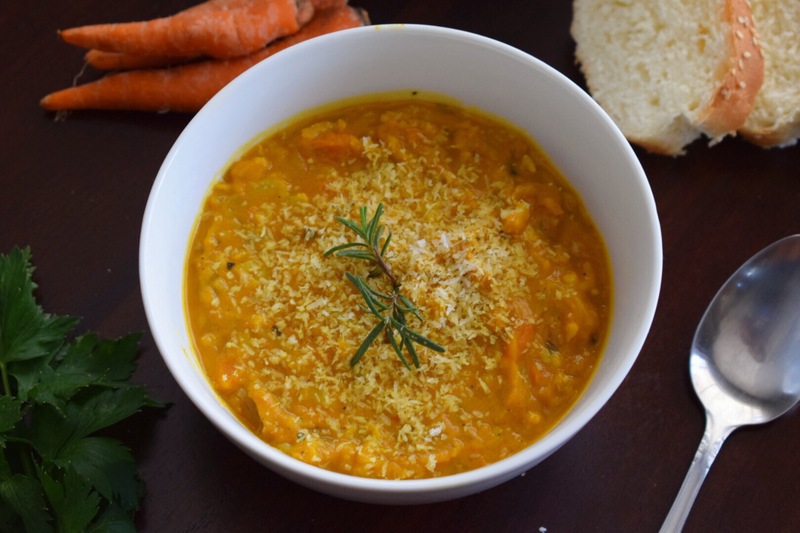 Throw in the butternut, cauliflower and carrots followed by the turmeric, cardamom and basil. Toss with a wooden spoon to ensure the vegetables are coated with spice. 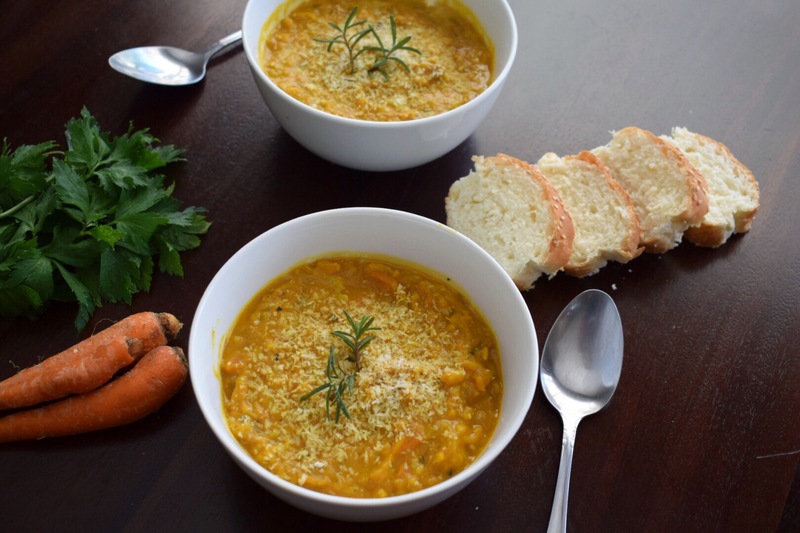 Pour in the 2 cups of vegetable stock and bring the mixture to a boil before reducing the heat to low and cooking until the butternut pieces are fork tender – between 20 and 25 minutes. 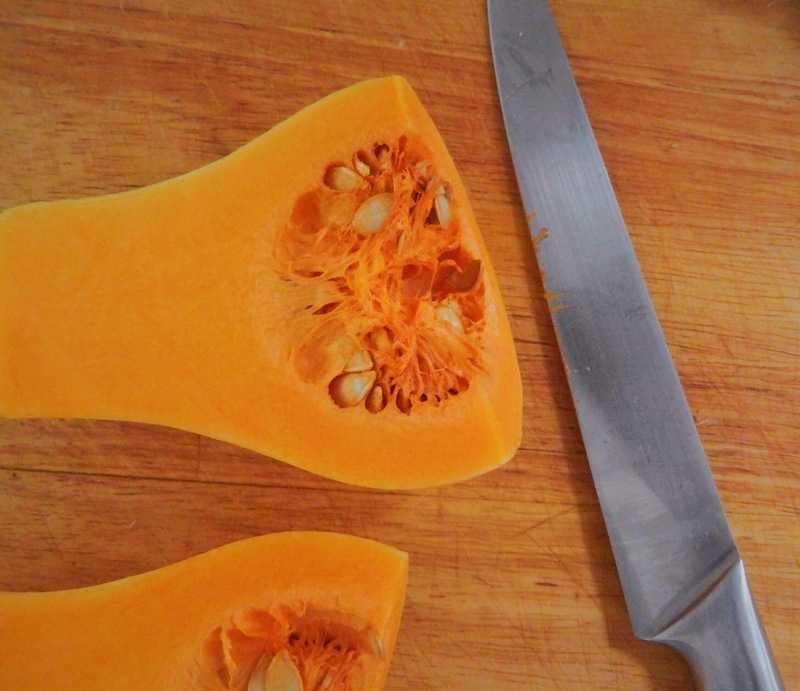 Once the butternut has softened, remove the pot from heat and use an immersion blender to bring it all together. If you find that the soup is too thick then add vegetable broth 1/4 cup at a time until it’s loose enough for you. If you find that it’s too thin then return the pot to the stove and boil for 5 minutes or so until reduced to your liking. 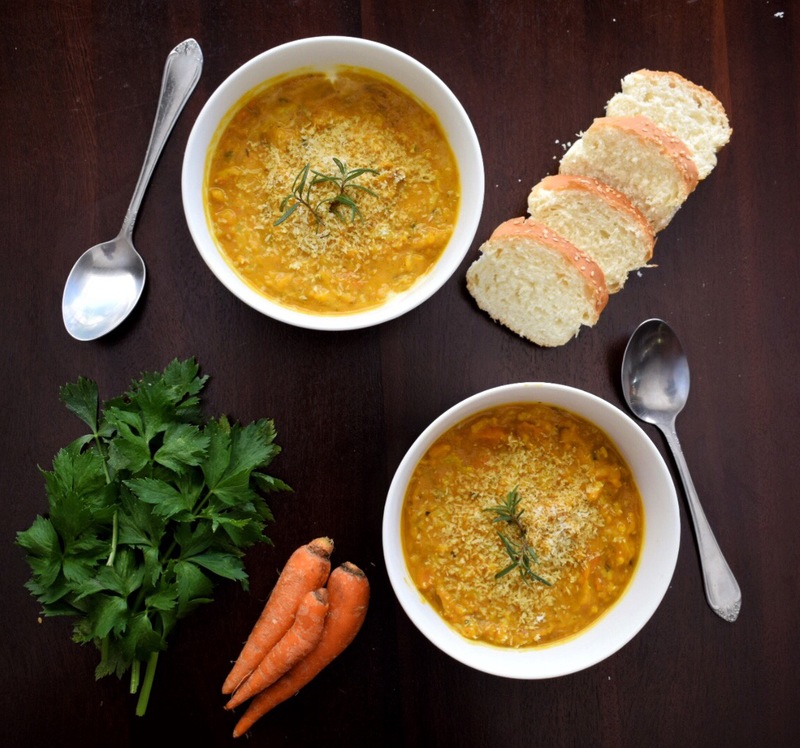 Ladle the soup into serving bowls. To create lovely patterns in your soup, carefully pour the coconut milk over the soup, moving the measuring cup over the bowl so as to create a pattern on the surface of the soup. Garnish with fresh herbs and serve immediately, this soup can keep for up to 3 days refrigerated, but it must be heated up on the stove before consumption. A frittata to make your heart beat fasta. A quiche to suit your niche. *May not actually satisfy cravings or solve any of yours, or life’s problems. Quiches are not a lot of work. No joke. Well, they’re a lot of work if you hate making your own pie crust, but then again you can always cut corners by buying your own pre-made crust (Don’t worry, I won’t tell). 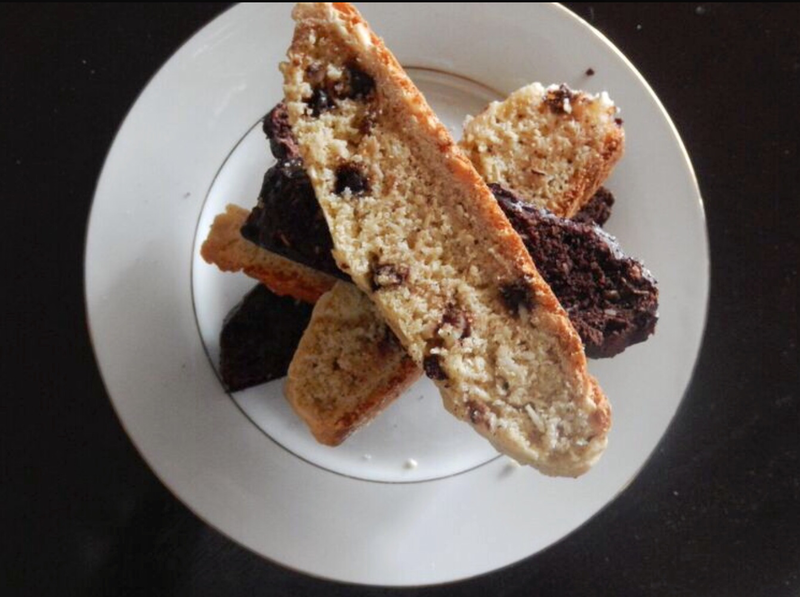 Once you’ve resolved the pastry issue you are, as I quote my matsh teacher, ‘home and dry’. 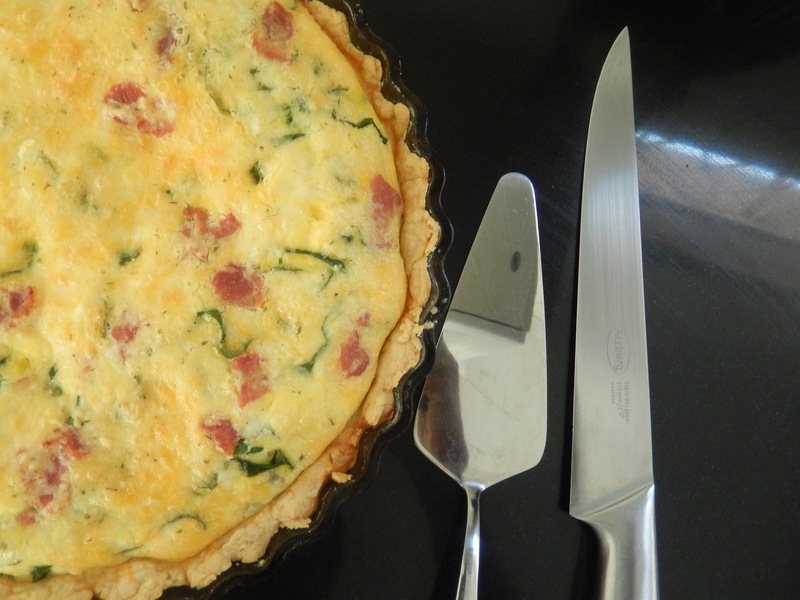 To me, quiches are that Saturday morning breakfast. You wake up at 7 am, throw this in the oven and let it bake for 45 minutes whilst you shower, pick today’s outfit and apply your make-up. (Ha, what a joke, in what world does all that take 45 minutes?) 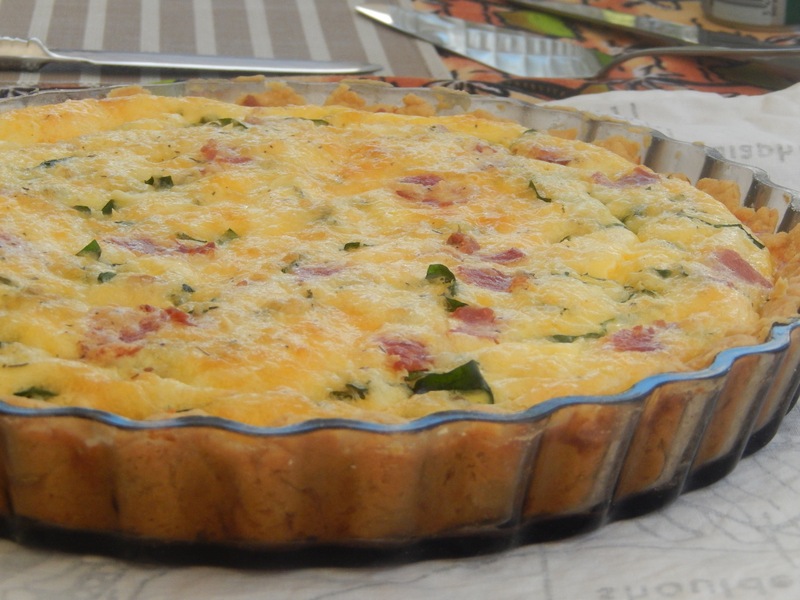 A quiche is the dish you serve your friends when they come over for brunch, and whilst they are all fawning over this heavenly dish, you will toss your hair effortlessly and say, “Well, it wasn’t much effort” while basking in their awe and admiration. AND YOU WILL BE ABLE TO SAY THAT AND MEAN IT BECAUSE IT’S TRUE. Because c’mon, who doesn’t enjoy having their ego fluffed once in a while? Brownie points (or should I say quiche points?) 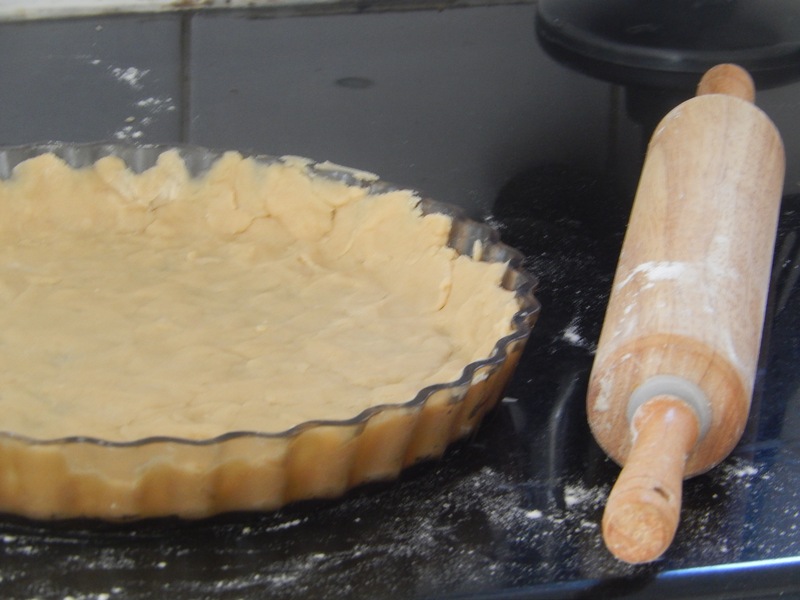 if you made the pie crust yourself, and I used this recipe from Sally’s Baking Addiction. It’s awesome, trust me. Sally’s awesome too, she’s got a really cool blog, you should check out the rest of her website whilst your quiche is baking away happily in the oven. Once you’ve got the pie crust sorted, you’re ready to rock and roll. If you’re reading this right now then thank you for giving me a chance! Having this special bond that we have, the bond that is only known between a blogger and their readers, I feel that I am ready to take this relationship to the next level. We are moving onto Tier 2. And this is where I tell you about my obsession. You probably know it as the mushy gruel that your mother forced down your mouth until you were eight years old. Well, I’m here to change that preconceived idea. For now, wipe your memory clean of any negative oatmeal-related thoughts, let’s start off on a clean slate. Oatmeal can be delicious. YES, say it with me now, oatmeal can be delicious. Think of the gross unsavoury oatmeal you had as a child as the nerdy pimply twelve year old girl. Now think of this dressed up oatmeal as the same girl ten years later. METAMORPHOSIS! Her braces are gone, her skin has cleared up and she’s finally decided exactly what she wants to do with her hair. She is confident. She is beautiful. She is the oatmeal I am about to introduce you to. At this stage, if you are still unconvinced, let me talk you into it. She’s smooth, silky smooth, her grains roll right off your tongue. She can go from 0 to 60° in just 5 minutes. She can be hot as hell or cool as ice depending on your preferences. She can do whatever you want her to do. Baked? She can do that. Put into a pancake? She got that down. Crunchy and savoury? She was ready for that the day she was born. Face it, Oatmeal 2.0 is the perfect woman- errrrr, food. She is unstoppable. More on the superhero abilities of Oatmeal 2.0 will come later, but I just thought I would introduce you to my (and soon to be yours too) obsession. Sorry, I just think that it’s a really fun word to say. So, shakshuka, what is a shakshuka? 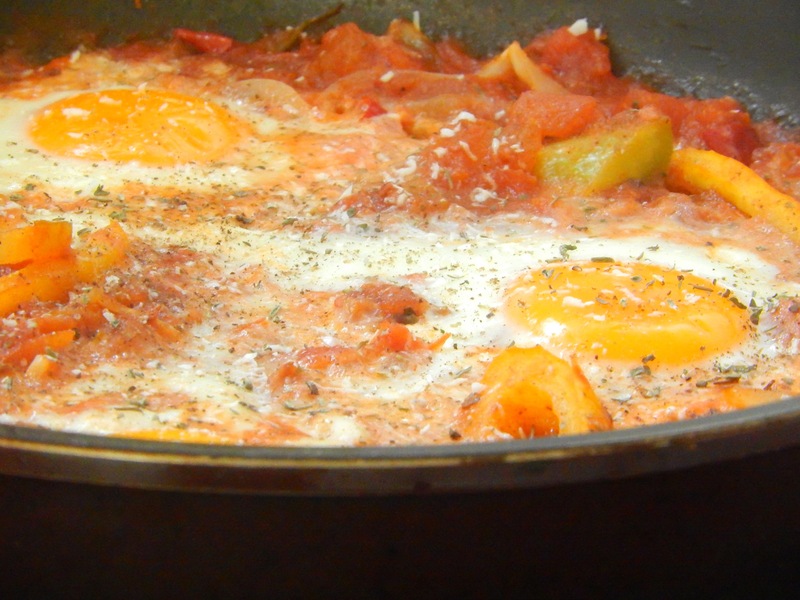 A shakshuka is (commonly thought to be) a Tunisian dish. In a nutshell, it’s eggs that are poached in a thick (often spicy) tomato stew. The actual origin of this dish is unknown but it is widely served throughout countries in North Africa and the Middle East, stretching from Mauritania to Israel, the shakshuka proves to be a popular breakfast dish. 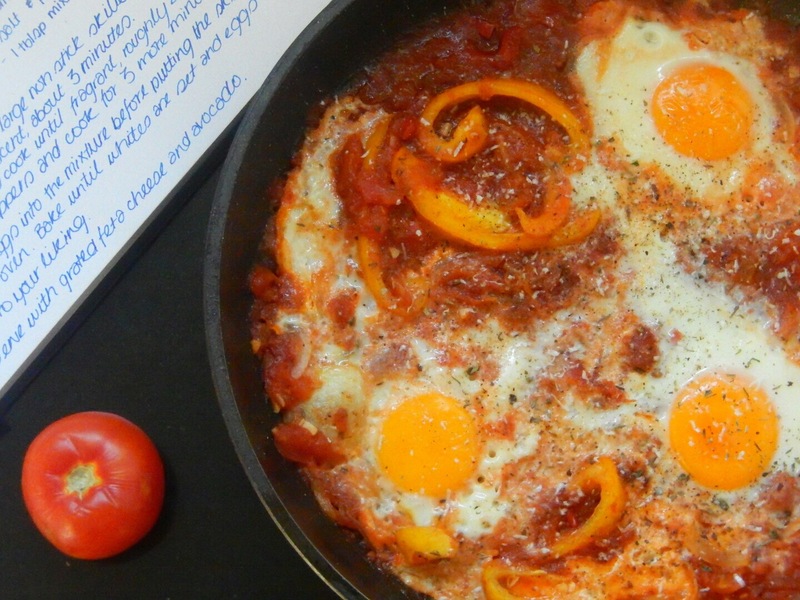 So what is so special about a shakshuka? I can sum it up in just three words for you: shpicy, shavoury and delishious. And yes, I do know how to spell, but I also like to think I’m funny. This dish is sharacterised (okay, I’ll stop now) by the tomato base, get this right, and you’re already 80% of the way to success. Whether you use canned tomatoes or fresh tomatoes is all up to you, I happen to find that I don’t need to add any extra salt or sugar when using tinned tomatoes. However if you are using fresh tomatoes, you’ll need to make sure that you dice them into really small pieces, and the cooking time is going to be extended by at least 7 minutes while the tomatoes simmer and break down into that lovely stew. As far as spice goes, I tend to have no boundaries. Feel free to reduce the amount of chilli, or omit it all together if you are not a fan of spicy food. I’ve been informed that I do tend to go overboard sometimes, so please, drop a comment below if you need me to slow down on the spice. I like my eggs to be slightly underdone when I’m making this dish, as I love to mop up the runny yolk with a slice of whole wheat toast (and I’m drooling). So usually, if I am making this dish, I’ll bake the eggs for about 12 minutes, but if you’re hard set on having them well done (get it?) then you should bake your eggs for 15 minutes. But seriously, look at those lovely lovely yolks! I find this best served with avocado slices, grated feta cheese and a slice of whole wheat toast. Add the garlic and cook for about 30 seconds before adding the pepper(s) and cooking for another minute. 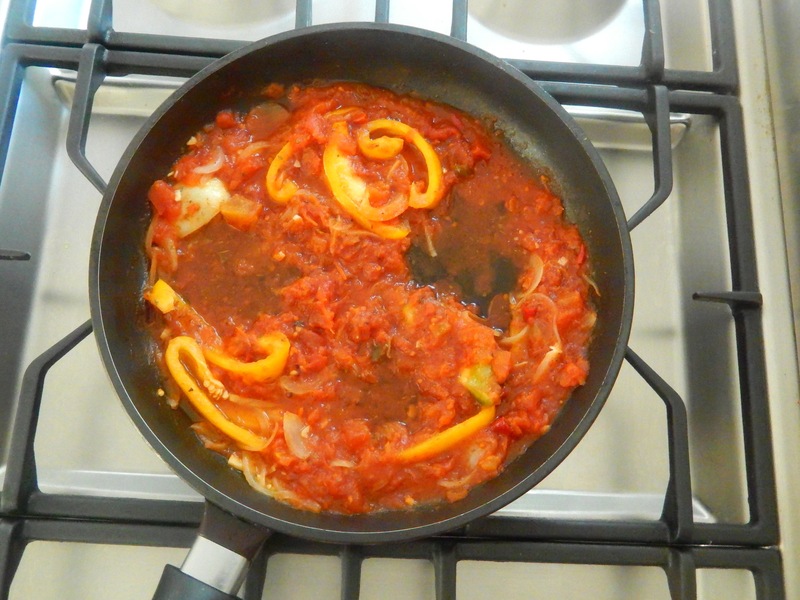 Reduce the heat to low before adding the tinned tomatoes and chillies and simmering for a further 3 minutes. If using fresh tomatoes, simmer for 10 minutes, until the tomatoes have broken down and released their juices. When the whites have set and the yolks are done to your liking, season with salt and pepper. Sprinkle the top with feta cheese and serve with toast and avocado. Hello and welcome to The F Scientist! My name is Andrea Makamba and I shall be the primary author on this blog. Just a little information before we begin, I’m seventeen years old, I live in Zimbabwe and I have an awfully unusual relationship with food. Some days I wake up wanting to make everything in the kitchen. Other days I can live on an apple and a bottle of water. I’ve lived on both ends of the scale and through love-hate relationships with it, but more on that will come later. Right now, I live in the healthy green area where I can enjoy food in good stead neither stressing about calories nor piling on all the carbs (Yay!). Enough about me, onto the food. Chicken kebabs, roasted potato chips topped with ranch dressing and chilli sauce along with a jug of passion fruit juice. Living in Zimbabwe, going to ‘braais’ (meaning outdoor barbecues, pronounced br-ys) forms a regular part of any teenager’s social life, and so I thought it would be fitting for my first post to reflect that. He’s smiling for the food, not the camera.. These chicken kebabs. Let me paint you a picture; tender chicken breast meat, the sweet yet tangy taste of lemon in your mouth, the aromatic garlic filling your nostrils. I could go on, but I wouldn’t want you to end up with a puddle of drool on your screen. This recipe is perfect for your Sunday afternoon barbecues, whether it’s just you and the family, or you’re hosting friends. Best served with baked potatoes and a cold glass of summer punch. Start by cutting the chicken breasts into thick cubed pieces, about 1 and ½ inches thick. Optional: Fill a large bowl with water and add a generous amount of salt to it. Soak the chicken in this solution for about 20 minutes then drain well. This is known as brining the chicken. Also soak the skewers in ice water for 2o minutes. Combine the garlic, rosemary, coriander, thyme, herbs and lemon juice in a small bowl. In a small cup, add the brown sugar, cornstarch and water and mix until both the sugar and cornstarch are fully dissolved. Add to spice mixture and stir until well incorporated. In a large clean bowl, combine the chicken and marinade and use your hands to mix together until the chicken is well covered by the marinade. Thread the chicken onto the skewers leaving a gap of about 2 inches on either end. Place the skewers in a medium sized baking dish and refrigerate 6 hours or overnight. Reserve any leftover marinade, cover and store in the fridge. When you’re ready to cook your kebabs, remove them from the fridge and allow them to reach room temperature while you either preheat your oven to 180°C/350°F or you heat up your grill/ build your fire if cooking over hot coals. Grill the kebabs for about 15 minutes on each side, or until the meat is no longer pink in the centre whilst continuously basting with the reserved marinade. Serve with ranch dressing and kick back with a cold beer or summer punch.